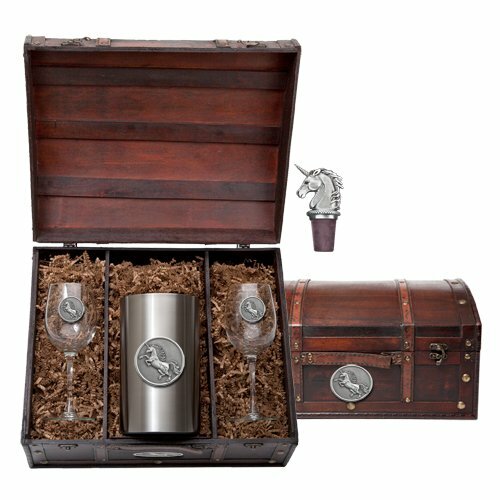 1pc, Pewter Unicorn Wine Chest Set, chiller, two (12 ounce) glass goblets, and a bottle stopper. This chest boxed set contains one stainless steel wine chiller, two (12 ounce) glass goblets, and a bottle stopper. The wine chiller is double wall insulated and, along with the goblets, is embellished with a fine pewter casting. The bottle stopper is cast in solid fine pewter. The synthetic cork will not stain or crack. It comes equipped with a chain attached to a ring which goes around the bottle's neck. If you have any questions about this product by Pewter, contact us by completing and submitting the form below. If you are looking for a specif part number, please include it with your message.